I’ve been having beige-induced blues lately. How did I end up with so much stuff in boring neutrals? Our walls and carpets are screaming for a fresh look. Since those projects aren’t going to happen for a while, I found a much more affordable project to add some new life to the living room. 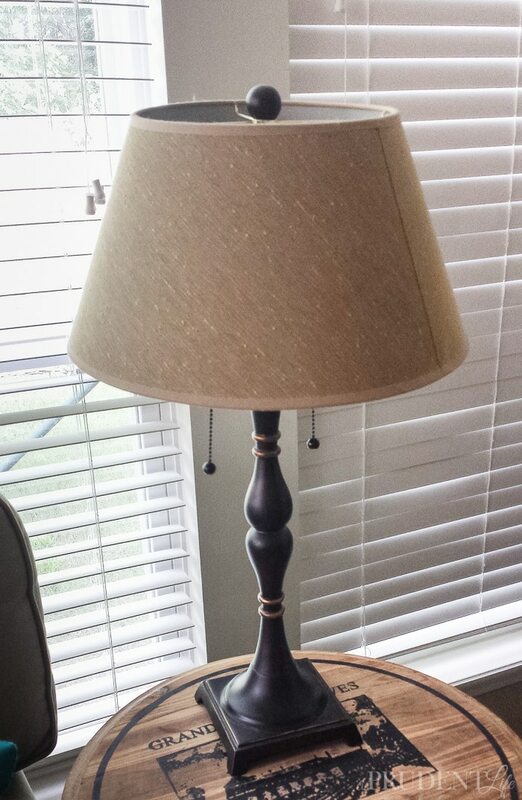 For $10, I was able to give an old lamp a chic personality AND I found a new favorite DIY product along the way. I started with this nice, but stuffy, lamp that used to be in my office. The neutral lamp with the neutral carpet, neutral walls, and neutral furniture equaled blah, blah, BLAH! I had some coral spray paint left from the new dining room centerpiece, which was perfect. I love it when I can use products from other projects. Cost savings aside, it also helps tie the rooms together when you repeat the same colors. Unless it’s beige, then it just makes you want to pull your hair out. 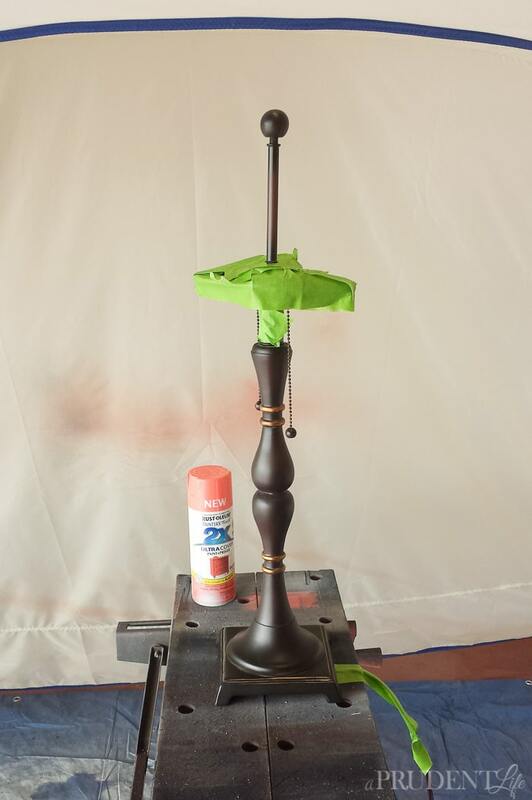 Before painting, I removed the shade and taped off the electrical parts of the lamp. After a few coats of paint, I had a little problem. 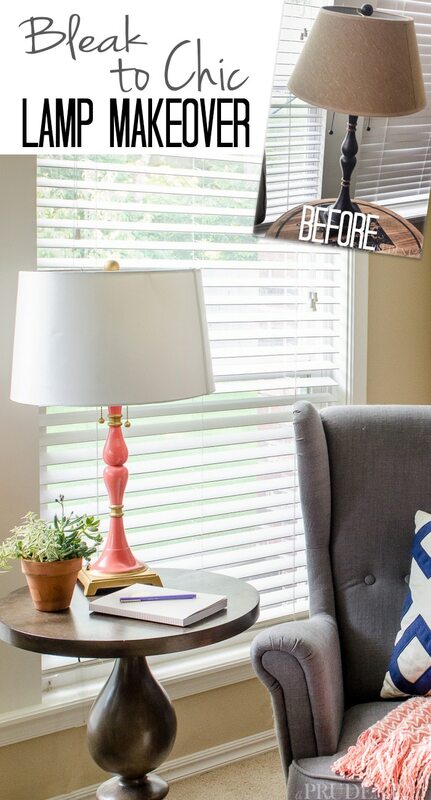 The lamp was leaning towards looking like it would fit perfectly in a country-style home. Not bad, but not at all what I was going for. I was hoping for a super shiny finish, and it was more of a semi-gloss. I headed to the hardware store to see what I could find to save my makeover. Four dollars later, I hit the jackpot. 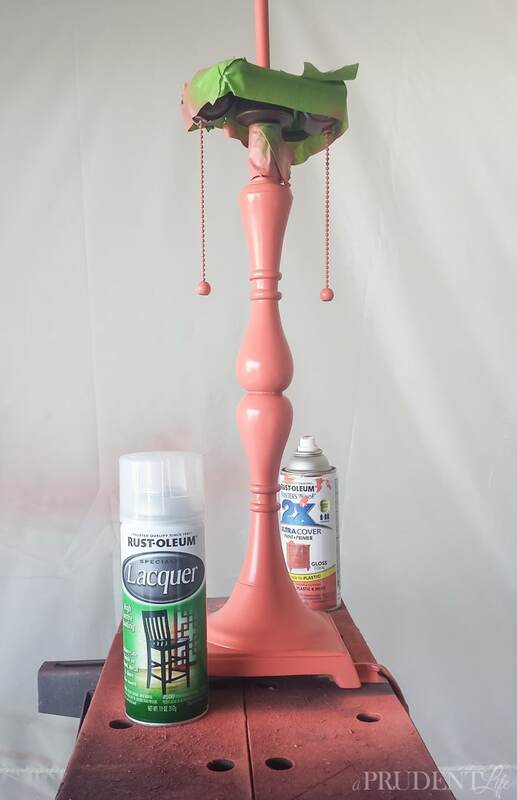 After reading lots of bottles, I settled on a clear spray lacquer by Rust-Oleum. It worked perfectly! I did three coats to really build up the shine. Then I started running through the house grabbing other things to lacquer. Seriously. If you like shine, you need this stuff! From the beginning of the lamp makeover, I knew I wanted a white drum shade. Still sticking to my low-budget plan, I found the perfect shade at WalMart. Except I got home and found out that the screws at the tops of lamps are different sizes and the shade wouldn’t fit. Ugh. Then I hit jackpot number two. I thought I’d try a couple of thrift stores to see if I could score a great deal before spending $20 on a shade at Target. In our area, unsold clearance items from Target go to Goodwill, so I tried the Goodwill first. I couldn’t believe my eyes when I saw the perfect size white drum shade for $6!!! The lamp was coming together! I moved it to the living room and lived with it for a week or so, but kept putting off taking pictures and sharing it with you because it still wasn’t quite right. I should have guessed sooner, but all it was missing was some gold accents. Friday I broke out the gold Rub n’ Buff and applied it to a few sections of the lamp. SO MUCH BETTER! It’s now the chic masterpiece I wanted! The whole reading corner feels more modern and like it actually represents our style. You may notice that I also swapped out the side table with one from the other side of the living room. Sometimes when you’re in a decor funk, you just need to move around pieces you already own to make a huge difference. It took me several weeks of progressing through the duller coral finish, adding the lacquer, then adding the gold to get the perfect look. The end result shows that sometimes I just need to be patient and let the design come together over time. Lesson learned! Here’s one last before and after for pinning! Melissa, now with that beautiful coral color the lamp has a unique and special look to it. Like you found it at some high end shop! What an awesome compliment, thanks Stacey! Love love love the look of this lamp! You knocked it out of the park with this one Melissa. Well done! Wow, that turned out beautifully. And the gold accents really made it. Great job! 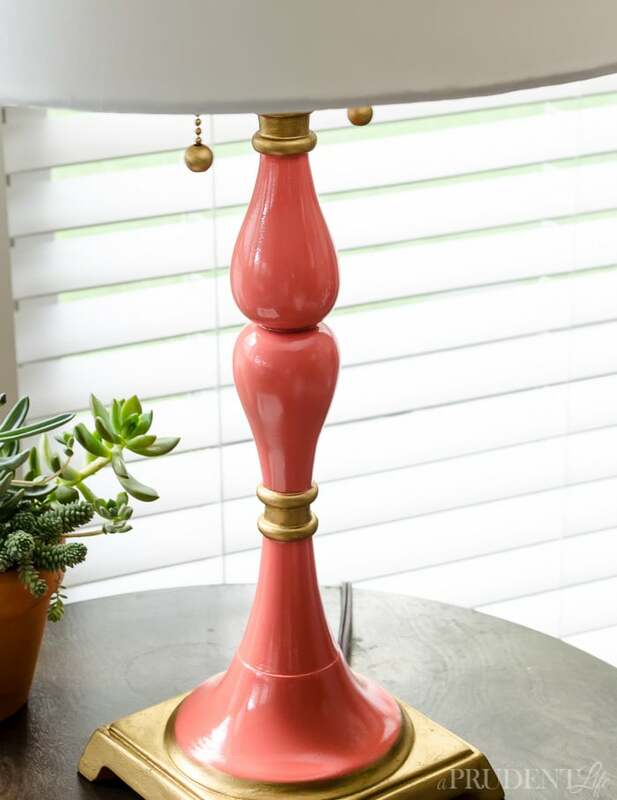 The coral is the perfect pop of color, and the gold accents simply make the lamp. Love it! Thanks for linking up at this month’s Pretty Preppy Party! 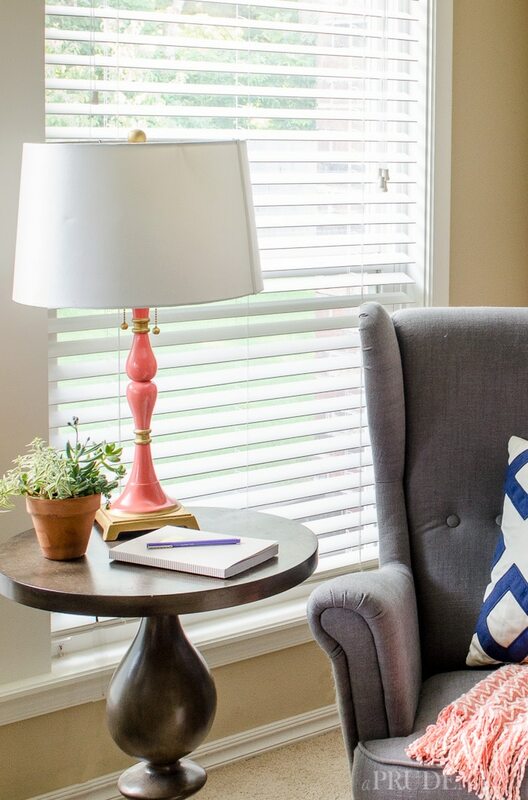 I absolutely love this lamp…it’s chic, cute, just the right amount of color to pop in a room, not overbearing…gotta try this! Thanks for sharing! Thanks so much Gail! And sorry it took me so long to thank you!